Drake is gifted at many things - rapping, random acts of kindness, bringing back cancelled TV shows. But, for many football fans, he's also becoming a bit of a pain. Paris Saint-Germain's Layvin Kurzawa is the latest footballer to pose for a photo with the Canadian star and have his team lose their very next game. PSG's spectacular 5-1 loss to Lille has reignited suspicions that Drake, while obviously multi-talented, is a curse on every sports star he meets. And a fair number of footballers have been among the thousands who've flocked to see him perform. Paul Pogba saw Drake perform at the Manchester Arena and got a picture taken with him - not long before Manchester United lost 2-1 to Wolves in the FA Cup. 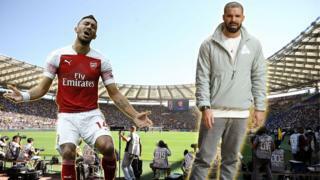 It was a similar story for Arsenal's Pierre-Emerick Aubameyang, who was at one of Drake's seven shows at the O2 in London. After losing 1-0 to Everton the following weekend, plenty of Gooners will probably be wishing he'd never posed for a picture. He missed a penalty in the Champions League as Man City lost 1-0 to Tottenham earlier this month, not long after he'd been photographed with Drake at a show. In a way, it kicked off with Drake's beloved NBA team the Toronto Raptors. He became a global ambassador for the club in 2013, and can be seen cheering them on from the sidelines whenever they've got a big game. Roberta Vinci was a 300-1 underdog when she faced Serena in the US Open - but we're pretty sure by now you can guess what the outcome of the match was. Any guesses who he'd been hanging out with beforehand? With so many infamous examples, it's unsurprising that Drake has got in on the joke. Ahead of the game that decided who'd be playing in the most recent Super Bowl, Drake wore a jumper featuring the logos of all four teams that were in with a chance. What followed was the lowest-scoring Super Bowl in history - a curse in the eyes of everyone who watched it. Drake's tour is about to come to an end - so it looks like, for now, Roma might be in the clear.